Buy Local! 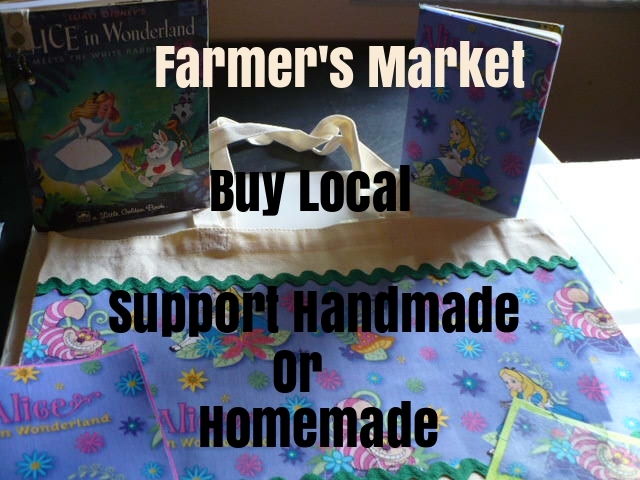 Support Handmade or Homemade! A great way to buy local is at your farmer's market day. Does your town host a farmer's market day? I'm so excited that the town next to me here in Florida is now starting their own farmer's market day. Wahoo! The Tractor Supply Store in Osteen, Florida is hosting the first Market Day on July 9th. I am getting busy increasing my inventory so that I can sign-up for a future event once the weather gets cooler. But, in the meantime, I will be going to do my part to buy local and support the other handmade and homemade Artisan's in the area. I'd like to hear from you in the comments box below. Do you support your local farmer's market? What is your favorite reason for doing so. What about your local Tractor Supply Store? My favorite reason for visiting is to buy organic vegetable plants and seeds and browse the Mary Jane's Farm magazine while I wait for my husband who is like a child in a candy shop cause there is so much to see. If, you'd like to see some of the handmade products that I will be selling at the farmer's market take a look at my post about my Gift Sampler Boxes. My Etsy shop is always open to you 24/7 from the comfort of wherever you are via internet access. I ship anywhere around the world too. We hope you have enjoyed our June news from our MOS Gift Club. We look forward to reading your comments. Don't forget to use the hashtags #cheerup and #MosGiftClub and share our post on your social media to win one of our irresistible handmade gifts each month. I love my local farmer's market. I find wonderful produce, creative crafts, and fun people who enjoy the simple pleasures of life. I think these markets are overlooked by many people and that's a shame. Lynda I agree that farmer's markets are overlooked by most in the community. That is why I was so excited to share about one coming in our area to help spread the word and get folks to support it. Love your new look! Love this post too. We have always supported our local farmers markets, local farms and local artists too. We are fortunate to have two feed and grain shops locally and the tractor supply shop is over an hour away. Just love all the selections of quality goods from plants, produce to gifts and baked goods. Love shopping with #mosgiftclub for unique one-of-a-kind items too! Thank you for the guidance on how to get my new look. #Mosgiftclub loves sharing gifts that let your light shine so you can live your faith. Your comments are always uplifting!